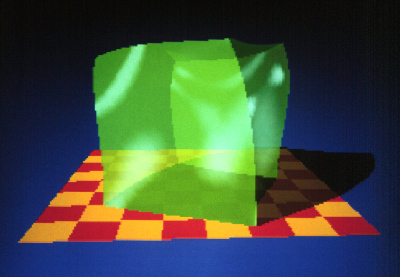 my scholarly work on Jell-O: Ray Tracing Jell-O Brand Gelatin. The above paper was featured in the SIGGRAPH '98 Time Tunnel and the book Seminal Graphics: Pioneering Efforts that Shaped the Field, published the same year. 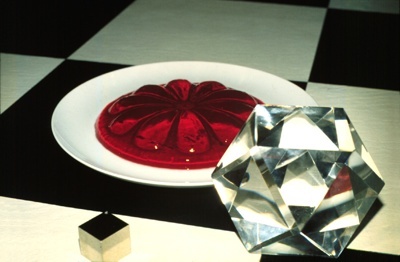 Jello: A Biography by Carolyn Wyman, book on jell-o folklore. 2001. Jell-O Museum run by the Le Roy Historical Society, Lynne Belluscio, curator. 23 E Main St, Le Roy, NY 14482-1209. (716)768-7433. Le Roy is a small town near Rochester. The New York Times (7/27/97, p. 1) had an article about the museum. Jell-O celebrates 100th anniversary, news story from KnightRidder Newspapers. (another copy) Excerpt: "The source of the protein that makes up Jell-O is hide trimmings, animal tissue that is rendered, purified, filtered and then purified again, leaving a simple protein called collagen." Jell-O fest, Brigham Young University, "a special tribute to Utah, whose residents consume more than 4 times as much Jell-O per capita than anywhere else in the country." Hey, what's that jiggling on my plate? !, humor column about jello by "Mad Dog"
Sarah E. Newton. '"The Jell-O Syndrome": Investigating Popular Culture/Foodways.' Western Folklore 51 (July 1992), No 1, p. 249-267. 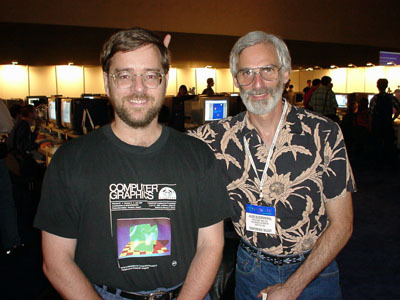 Me and Jules Bloomenthal (Jell-O co-conspirator) at SIGGRAPH 99. I'm wearing the official Ray Tracing Jell-O Brand Gelatin t-shirt.